Hunger striker Taras Pastukh says Lviv is blackmailed. 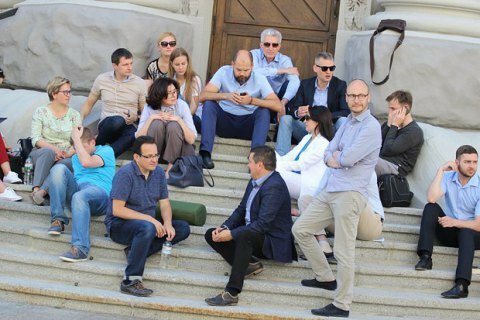 The problems with the inability of Lviv to take out its solid waste can be resolved by Monday, Self-Help's lawmaker Taras Pastukh told LB.ua on Friday, 23 June. "The temperature of the debate is very high so it may happen even before Monday," Pastukh said. The people's deputy says the central government is blackmailing the Lviv City Council. Pastukh described yesterday's statement of the region's governor and regional council head as blackmail. "Their words 'Give us the utility company and 300 million and we'll find where to get the garbage' has dotted all i's." "It sounds like an ultimatum but I am convinced that the city council will cooperate to resolve the problems for the sake the people of Lviv. If it's about money, let them have it and do the job," said Pastukh. The lawmaker sees no legal ways to implement the proposals of Zubko and Sinyuka and considers the proposal to be blackmailed. "Under the law, a city council cannot delegate powers to a regional administration," he reminded. In any case, the deal between the city council and regional administration should be firm and clear, Pastukh says. "The regional administration will not just get money from the city coffers and the utility company to its disposal. We need to make sure that the situation will not repeat in two month, so contracts with [regional] dumping grounds should be concluded for at least a year or two," Pastukh stressed.